The 2011 Touareg got more than a facelift from its predecessors: it’s bigger, more powerful and more refined, with a revised interior. According to Volkswagen, the 2011 Touareg got more than just a facelift. This, claimed the company, was a complete overhaul, from stem to stern. Bigger and more powerful than its predecessor while being some 195 kilograms lighter, it got a new turbo-diesel V6 engine as well, which joined a 280-horsepower V6 gas powerplant. A revised interior and an all-new platform rounded out the second generation of Touareg, which took home the Automotive Journalists Association of Canada Best New SUV over $50,000 award for 2011. The turbo-diesel TDI V6 may have been the most refined engine of its kind on the market. Very user-friendly, it displaced 3.0 litres and developed 225 horsepower, with a more than substantial 406 foot-pounds of torque. Both diesel and gas powerplants were mated to an also-new Tiptronic eight-speed automatic transmission. VW’s 4Motion all-wheel-drive came with both engine choices, and an electronic stability control system was standard. The full-time all-wheel-drive system featured an off-road setting and low range, and this generation of the Touareg had a 3500-kilogram towing capacity. According to VW, a single tank of diesel fuel would take you at least 1,200 kilometres. More if you were careful. On the other hand, the 2011 TDI version was more expensive than its gas-fuelled stablemate. 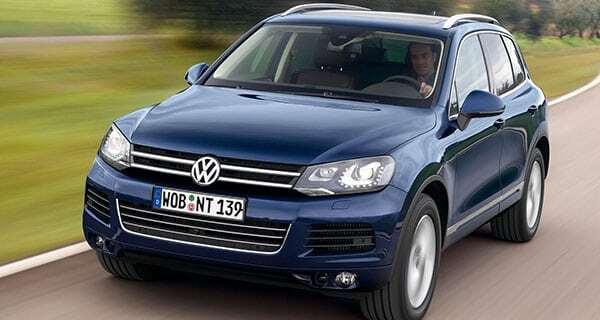 As befit an upscale SUV, the 2011 Touareg came loaded. Standard equipment included a navigation system, heated front seats, Bluetooth connectivity, cruise control, Sirius satellite radio, hill-hold control, electronic brake distribution and hill descent control for off-road enthusiasts. Options included leather interior, a massive power sunroof, power-adjusting steer wheel, rearview camera and heated rear seats. There were three trim levels: Comfortline, Highline and Execline. Neither Transport Canada nor the National Highway Traffic Safety Administration in U.S. have any safety recalls out there for this year of Touareg. The latter organization, however, has nine technical service bulletins on file. These include non-starting and rough-running issues if the vehicle has sat for too long, “misfire or reduced engine performance,” timing chain “slippage” and “rattling” noises coming from the engine after a cold start. NHTSA also had seven registered complaints from owners. A sampling: “At highway speeds … the steering wheel shakes dramatically,” “the HPFP (injector pump) failed. After three weeks, the vehicle is still being repaired,” “metal shavings in the fuel system required a complete replacement of the fuel system,” and “in a front-on collision that caused $22,000 of damage to the front of my vehicle, neither of the front airbags deployed.” The TDI versions of this generation of Touareg seem to be more problematic than the gas versions.